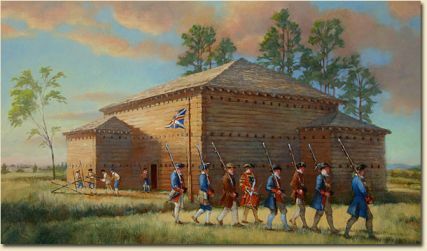 Fort Dobbs, located in present-day Statesville, was a defensive fort built in 1756 under the auspices of North Carolina's colonial Assembly during the French and Indian War. The large log fort, deemed necessary for the protection of frontier settlers during the conflict, was constructed by provincial rangers under the command of Hugh Waddell and named for royal governor Arthur Dobbs. Waddell and his rangers manned the fort and used it as a base of operations during the conflict. At times colonists stayed close to the fort's walls for protection. The fort was actually attacked by Cherokee Indians only once, on the night of 27 Feb. 1760, resulting in the deaths of one or two of Waddell's men and as many as 12 Cherokees. After the Treaty of Paris ended the war, Fort Dobbs was no longer essential to the protection of the colonists, who had seen the boundary of British settlement move farther west through the defeat of the Cherokees. The fort was dismantled, and its buildings eventually fell into disrepair. Archaeologists have determined the exact location of the fort, although its appearance remains unclear. The modern Fort Dobbs State Historic Site allows visitors to view the remains of the fort and also features displays of artifacts, trails, archaeological sites, a gift shop, and recreation facilities. Stephen Israel, Archaeological Research at Fort Dobbs: A French and Indian War Site on the Carolina Frontier, Iredell County, North Carolina (1971). Illustration of Fort Dobbs during the French and Indian War. Image courtesy of Friends of Fort Dobbs. Available from http://www.fortdobbs.org/history/#war (accessed September 19, 2012). What were the names of the men who died? "The fort was actually attacked by Cherokee Indians only once, on the night of 27 Feb. 1760, resulting in the deaths of one or two of Waddell's men and as many as 12 Cherokees." I have a reprint of a 1745 map of New France. Many places are identifiable but in one case there is a settlement listed as "Elaw" or possibly "Efaw" that was located in western present-day NC. It was close to the Appalachian Mtns and roughly WNW of "Cap Ferre" and "Cap Lookout." Are you perhaps able to identify this settlement? Hi! Thank you for using NCpedia! I am forwarding your inquiry to Reference Services at the State Library of North Carolina's Government & Heritage Library. Their contact information may be found at https://statelibrary.ncdcr.gov/connect#GHL. Thanks so much for using NCpedia!